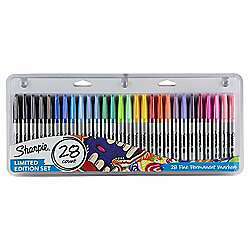 This limited edition Sharpie set contains 28 Fine permanent markers in shades ranging from candy pink, sunshine yellow, ocean blue and charcoal. These are brilliant. I have a pack from the offer earlier this year. Particularly good if you enjoy doing the adult colouring books (they are probably too nice for the kids lol). 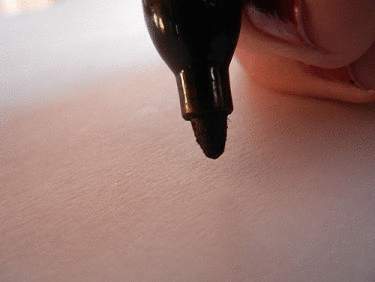 How are these for left handed people - does the ink dry quick enough that you do not smudge everything with your writing hand as you write? is their a way around the £4 charge if spending under £40 ???? Ah, b*gger - you can't have these delivered to the store for free pick-up? £4 minimum spend? S*d that - would have voted cold. 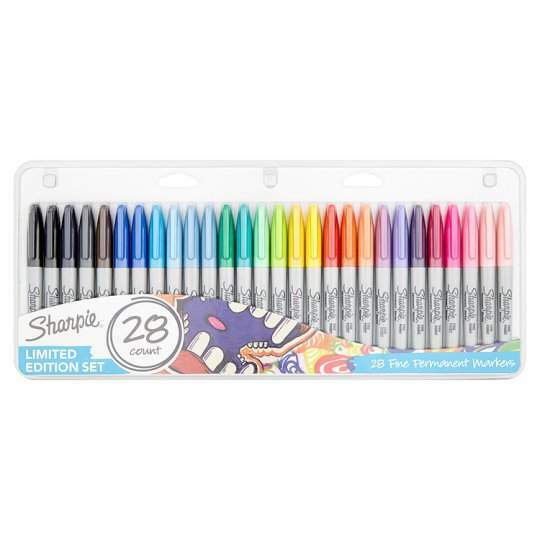 How are these for left handed people - does the ink dry quick enough that …How are these for left handed people - does the ink dry quick enough that you do not smudge everything with your writing hand as you write? delivery kills this for online - heat for the instore bit though! its unusual for these to be reduced to a price were they warrant being posted on here. They are £7.50 on Tesco Direct at minute. Might wait to see if go down to £6 tomorrow or would they honour it if price has reduced when I collect them? They are £7.50 on Tesco Direct at minute. Might wait to see if go down to …They are £7.50 on Tesco Direct at minute. Might wait to see if go down to £6 tomorrow or would they honour it if price has reduced when I collect them? thanks for that, ive just ordered from tesco direct at £7.50. with staff discount it works out about the same price as this deal. but i dont have the stupid £4 charge. don't left hand people write backwards though? These are brilliant. I have a pack from the offer earlier this year. …These are brilliant. I have a pack from the offer earlier this year. Particularly good if you enjoy doing the adult colouring books (they are probably too nice for the kids lol). Only when the Pope is around and accusing us of being rampant homosexual devil-worshippers. Weren't you lot burnt at the cross? pmsl, i think it's natures way of laughing at the intellectuals when you smudge your own writing... loving these comments... for Sharpies!!! lol. & stoned i can deal with, but Lego should come with a warning "Footwear MUST be worn"
pmsl, i think it's natures way of laughing at the intellectuals when you …pmsl, i think it's natures way of laughing at the intellectuals when you smudge your own writing... loving these comments... for Sharpies!!! lol.& stoned i can deal with, but Lego should come with a warning "Footwear MUST be worn"
Thanks, I picked up a pack at Havant, Portsmouth this morning. Label still £7.50 but scanned as £6. One pack left on shelf. thanks for that, ive just ordered from tesco direct at £7.50. with staff …thanks for that, ive just ordered from tesco direct at £7.50. with staff discount it works out about the same price as this deal. but i dont have the stupid £4 charge. Am I being silly...I can’t find them on the groceries website at all. No 28 packs showing, I searched for ‘sharpie’ and have a slot booked for tomorrow, but normally if something is not in stock at my local store it shows the item but says not available at local store. Am I being silly...I can’t find them on the groceries website at all. No 2 …Am I being silly...I can’t find them on the groceries website at all. No 28 packs showing, I searched for ‘sharpie’ and have a slot booked for tomorrow, but normally if something is not in stock at my local store it shows the item but says not available at local store. Ah, just says currently unavailable so must be sold out through groceries, thanks anyway. This website might be marked as work-related by your organization. Try to access this link in a new Microsoft Edge window outside of Windows Defender Application Guard.